I set myself a goal, and I’m off to a very good start. 3 x 50 gramme balls of Rowan Cashsoft Aran. Nice yarn, but it tends to pill, and so I wouldn’t use it to make anything that got significant wear. I’d made a hat and a pair of mittens and I had enough left for a scarf. Not a long scarf, but something to tuck into a collar on a cold day.
. It’s worked it rib, and so it’s reversible, which is what I wanted for a scarf. I cast on enough stiches for three repeats, three stitches in between each cable, and a border at each end. I used the alternate cable cast on. 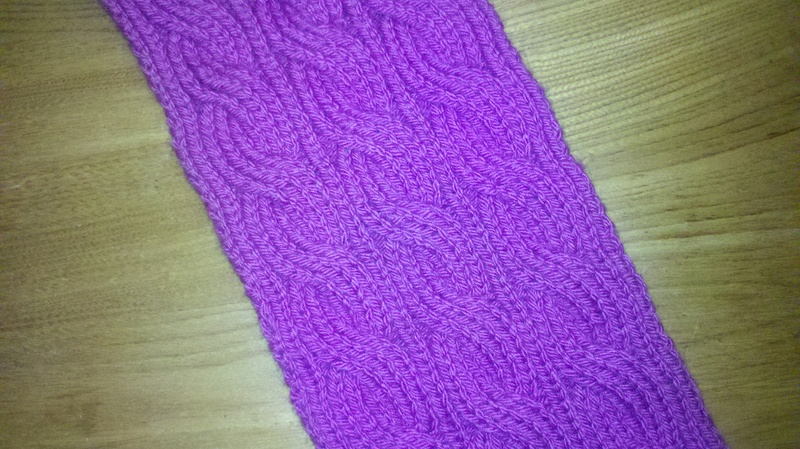 And then it was just knit one purl on rib, cabling every ten rows. The rows flew by, and it was wonderful television knitting. I went on until the yarn was pretty much gone and the two ends matched. The cast off was new to me – the invisible ribbed cast off which is something like Kitchener stitch – I went looking for something to match the cast on and this looked to be the best bet. Exactly what I wanted. I haven’t blocked the scarf, because I like being able to stretch it out when I put it on, and because I like hand knitting to look like hand knitting. 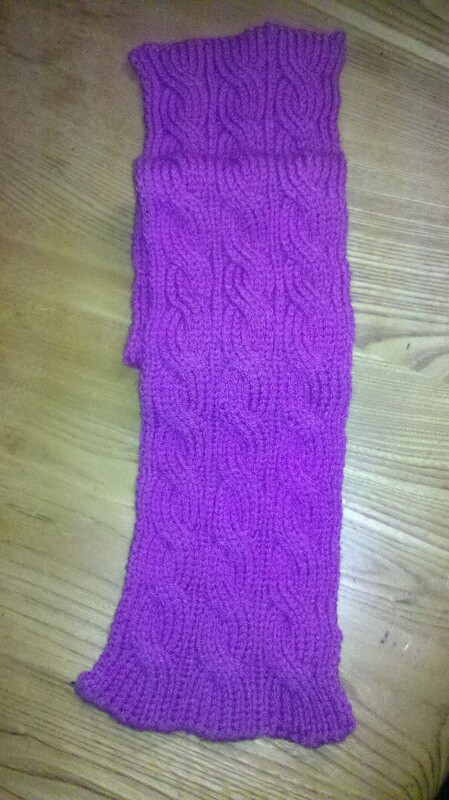 Another scarf. I’m trying out the double knitting technique to make a two-coloured, double thickness, reversible scarf. Now I have to keep the momentum going – watch this space! Lovely scarf – well done! It looks stunning! I like the fact that you used your own design too. Very nice – and very clever using your own design. It’s so pretty – I love the pattern. I am still working on my first scarf project. I don’t seem to find enough uninterrupted time to work on it these days. Lovely. I’m making a shawl for my mum at the moment. And I confess to never blocking my knitting. I like hand knitted to look hand knitted!